Print-On-Demand is becoming super popular due to the fact that you stay in your zone of genius (design) and outsource the rest (production and fulfillment). 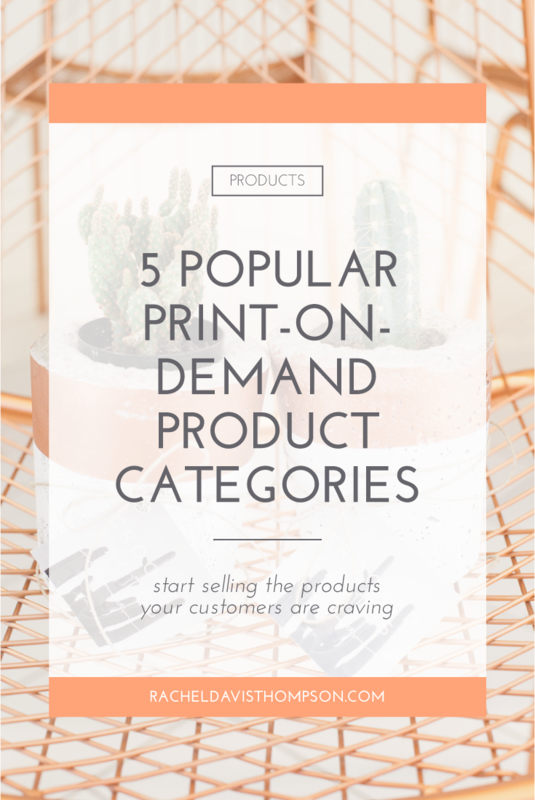 The number of products available for print-on-demand is vast, but there are some highly popular items that you may want to try in your product shop. This is by far the most popular print-on-demand product category. They come in all different styles…think t-shirts, tank tops, hoodies, sweatshirts, etc. They come in a ton of brands, a variety of sizes (XXS-XXXL) and are offered for every body type….men, women, youth, toddler, and infant. The most common option in this category is the classic t-shirt. I mean, it’s called a classic for a reason, right? It’s highly popular among shoppers and does well year-around. As an added bonus, apparel MSRP is typically listed at a no-brainer price point for the buyer, usually around $15-$30. Over the last ten years, the custom coffee mug has taken the retail market by storm. Consumers crave to express themselves in unique ways and the coffee mug is one of the ways in which they do so. Let’s just say that coffee mugs are now the new “graphic tee”. This is a popular print-on-demand category due to its cost-efficient price point, both for the shop owner and shopper. It’s also one of the top holiday gift items…think “Gifts Under $20”. They typically come in a variety of sizes and colors with the most popular being a white ceramic 11oz or 15oz mug. This product category does have seasonality, being more desired by consumers in colder months (October to January). We live in a digital world and shoppers want to jazz up their devices. Most print-on-demand providers have recognized this need within the market and have several tech cases available, including tablets, watches, laptops, cell phones, etc. The most common tech case hands down are cell phone cases. It’s usually offered at a great price point and has no seasonality. Score! Say hello to the home decor market. Art prints are a great category to sell in due to the fact that homeowners are looking for unique ways to enhance their decor style. Since print-on-demand art prints are so customizable, it makes it an easy sell for shop owners. Due to the rise of art printables, the print-on-demand art print gives consumers the design customization they desire along with the print quality they crave. Something that printables lack. Art prints come in a variety of sizes and mediums. As an added bonus, this product category has a competitive price point and has no seasonality. Print-on-demand has officially made the classic tote bag cool again. Totes are usually offered in a variety of materials, sizes, and colors. One popular consumer group for this product category is the wedding industry. Tote bags make a great gift for brides and bridesmaids alike. The price point is reasonable and no seasonality…sweet! Want to learn more about product categories as well as get behind-the-scenes product shop insights? Join the RDT “Dear Shop Diary” newsletter! A weekly, diary-style newsletter crafted especially for makers + designers, to help you run a more practical, purposeful, and profitable product shop.